Both procedures are explained in the next few pages. Plug one end of the serial cable into the communication port on your Newton. Use the cable that came with this manual. Plug the other end of the serial cable into the printer port ( ) or the modem port ( ) on your Macintosh. 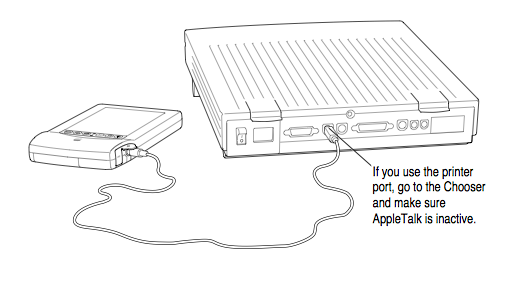 Important: If you connect Newton to a PowerBook that has an internal modem, you may need to open the PowerBook or PowerBook Setup control panel and select the External Modem button before you can complete the connection.